I followed Matt’s directions, though I accidentally let the breasts sit for 48 hours in salt (instead of 24) before hanging. I weighed the breasts and recorded their starting weight and the date on a piece of tape which I affixed to the door of the wine refrigerator. I also skipped the step of wrapping the duck breasts in cheesecloth, which Matt said was OK. I let the breasts hang in the wine fridge and I checked on them every 5 days or so, inspecting them for signs of bacterial growth (bad) and giving them a squeeze test [with clean hands] to check for doneness. After 25 days, they looked and felt about right, so I weighed them. They had lost about 27% of their weight, which was all from moisture leaving the meat. I called it “done” and carefully sliced off my first taste of home-cured meat. It was fantastic, if a little on the salty side. However, I’m really thrilled with the results of my first attempt and I can’t wait to start curing more and more meat! As it turns out, a wine refrigerator is reasonably ideal for this kind of curing. Temperature settings range from 45-65F with relative humidity of 55-75%, which is just about the sweet spot for slowly dehydrating and aging meat. Most models use a piezoelectric cooling element, which is quiet and barely sips electricity. Plus, these days, they’re cheap: wine fridges range from under $100 for a no-frills model, to $150 for a model with decent capacity, and well on into the stratosphere from there. Just remove all but the top rack and you’ve got space to hang tens of pounds of meat at once! I’m planning to investigate retrofitting my wine fridge with strips of ultraviolet LED lighting as a safeguard against possible mold or bacterial growth during the aging process. I also bought a USB scale, which I’d like to add so I can monitor the weight loss of my meats remotely. I’ll report back once the retrofit is complete, but in the meantime, I’m going to go enjoy a well-deserved charcuterie platter straight from my own home. 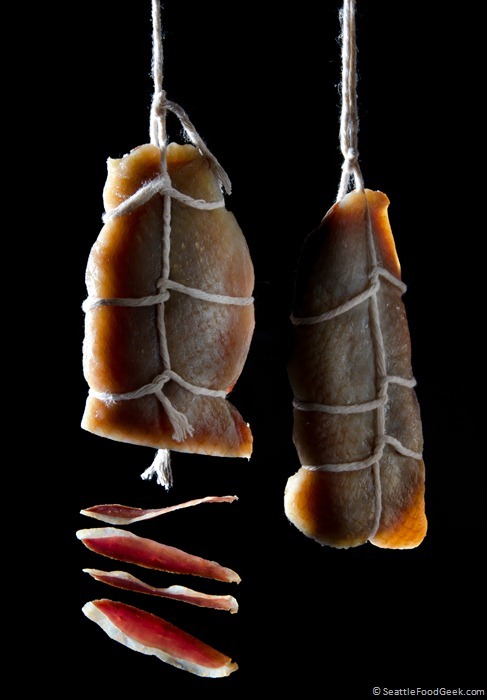 Further Reading: Check out Matt’s Home Cured Duck Prosciutto, and his other charcuterie recipes. He’s also got a great step-by-step guide on building a proper curing chamber at home. My friend jason has a great blog with lots of great cured meat info as well. That’s a fantastic photo. How did you do it? @Phil Thanks! The method I used is pretty oldschool, actually. I used extremely thin copper wire to hang the slices of cut prosciutto, then photoshopped out the wire. I also tried actially snapping slices as they fell, but I didn’t like the results as much. Wow! I do not know this. Thanks so much for sharing this with us. Thanks for sharing this. I am in the process of building a new smoke house and finding lots of fun cool ideas. Thank you again..may have to give this a serious try. 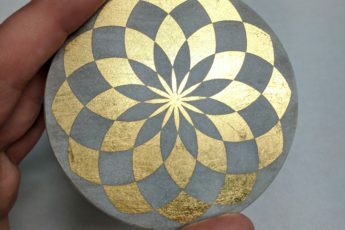 Piezoelectric cooling? How exactly does that work? Does it use the Peltier effect? Hey there. I’m using a wine frig to cure meats and i stumbled upon your article. If could answer a couple questions i would be most appreciative. Did u leave the door open a little bit to remove the damp air while curing? Did the fan run the whole time? And for how long did it take it to cure fully in the wine frig? I’m making salami right now, and i have no mold as of week 4. I’m not sure its working properly. Not 100% certain about this, but I do not think that UV light kills mold. If it did, then you would be preventing the good white mold from growing. You need the white mold to prevent the bad black and red mold from growing which is deadly. The white mold will also prevent case hardening, which in turn would cause your sausage to rot from the inside. I would like to propose the link exchange deal with your website seattlefoodgeek.com, for mutual benefit in getting more traffic and improve search engine’s ranking, absolutely no money involve. We will link to you from our Music and Entertainment authority site – https://www.loudthings.org/, from its homepage’s sidebar. In return you will agree to do the same to link back to one of our Music & Entertainment Site, from your seattlefoodgeek.com’s homepage too (sidebar, footer, or anywhere on your homepage), with our brand name Guitar Junky.